There’s been enough talk about taxes from our 24/7 media cycle that I’m not about to start discussing whether I think they’re “good” or “bad.” With that said, my annual visit to my accountant to file my income taxes has become a tradition stoked with manic anticipation that is nearly impossible to project. For whatever reason, when I was younger, I consistently overpaid in taxes and got some semblance of a refund from the government, which gave me a rather laissez faire attitude about the whole thing (why are so many people so vehement about taxes when I’m usually getting a little something back every year?). Additionally, because I started to treat these annual appointments as instances of guaranteed “found” money every year, I never fully understood why my accountant always seemed distressed by my inability to break even (all that money you’re overpaying in taxes is money that could be gaining interest in a savings account, she would tell me). My whole perception of the income tax process was distorted. But a couple of years ago, that trend changed and I owed the federal government – big – and I didn’t know what to do with myself. Where was I going to come up with that money to pay back what I owed? I had been saving and spending under the idea that I was always paying more than my fair share in every paycheck. I thought of it as a one year setback, but each year after that became more unpredictable. And last year, I was hit harder that I’ve ever been hit before, leading me to flat-out dread my appointment this year. Despite some steps I took to ensure that at the bare minimum I’d be breaking even with my withholding, and having the added benefit of getting a credit because my wife and I had a child last year, I could no longer trust the system, or my instincts for that matter. So the fact that I ended up getting a decent return this year was cause for celebration. 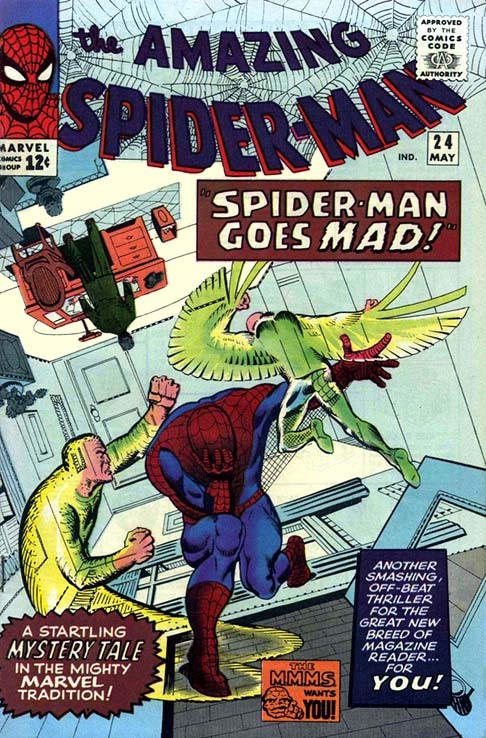 And with a little extra discretionary income in my pocket, I did what any other comic book fanatic who has a blog documenting his quest to collect every issue of Amazing Spider-Man would do. I saw to it that a portion of my refund would stimulate the economy by eliminating one of the remaining seven issues of my Chasing Amazing list. 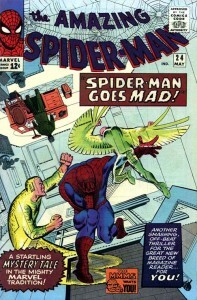 Going forward, I’ll now consider ASM #24 the comic book Uncle Sam bought me. I don’t know if I should really be all that jovial about the fact that I used money that was supposed to be mine in the first place to buy a Silver Age comic book, but considering how infrequently I’ve been making these purchases the past 4 months (this is my first new “old” comic book since Christmas), I’ll take what I can get. I’ll admit that it pains me a little bit when I get e-mails sent to me account about updated listings on eBay, or comic book shows coming to my area, but for the sake of my son and my family, I’m really trying to abstain for a while longer just until we get our financial bearings in order. At the same time, while I get the occasional “pang” that comes from withdrawal, I can honestly say that the time and emotional commitment that comes with being a new father has overshadowed any urgings I may have to go running to some comic book guy and recklessly spend money on my quest. As I’ve noted before, it took me more than 20 years of buying comic books to get to my current spot. Despite the fact that this blog is becoming the world wide web version of the “How I Met Your Mother” sitcom (seriously, how long does it take a dad to tell his kids how he met their mother), I know there’s enough of you out there who will hang with me until the day I ultimately reach my goal. This is a sweet issue–one of my favorites! Unfortunately, the copy I have is really beat-up–usually I don’t care that much about the condition, but this is one I would like to upgrade. 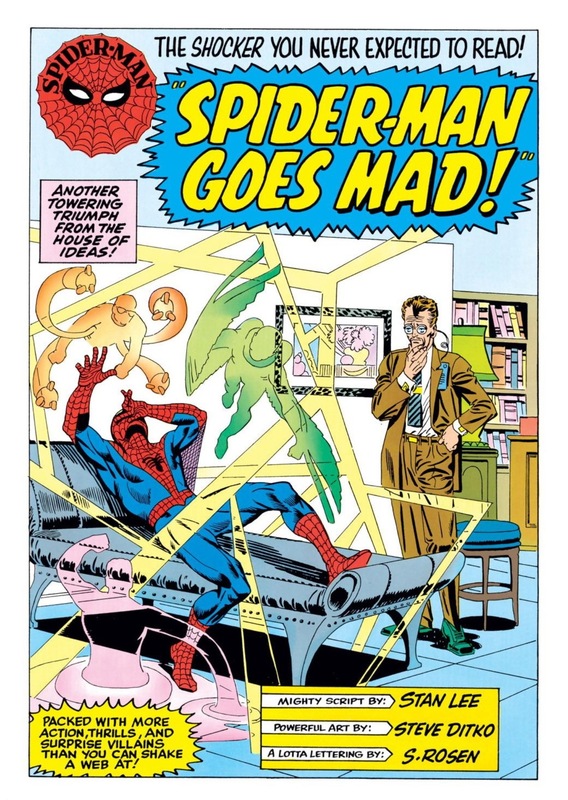 I really love the cover–with the upside-down room, the bricked-up doorway, Spidey with his hand on his face–he really looks like he IS going mad! 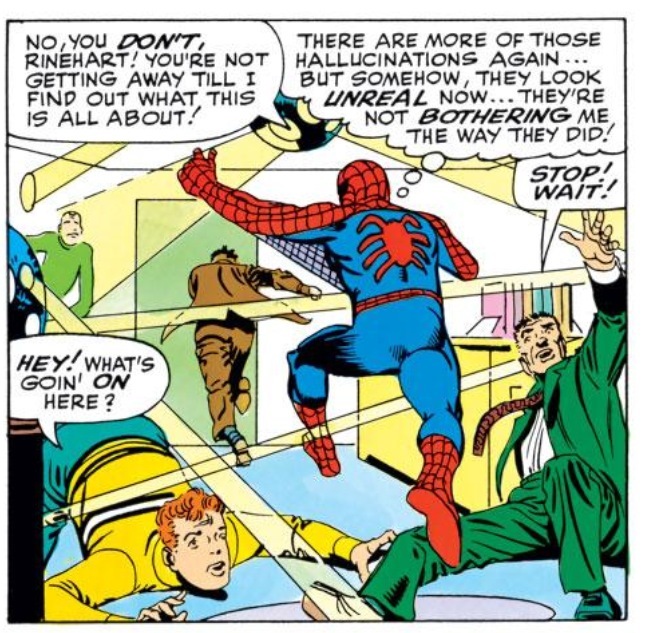 The sub-plot with Flash Thompson inside makes it something of a two-part story with issue #25.